Two acknowledgements but one piece of art. 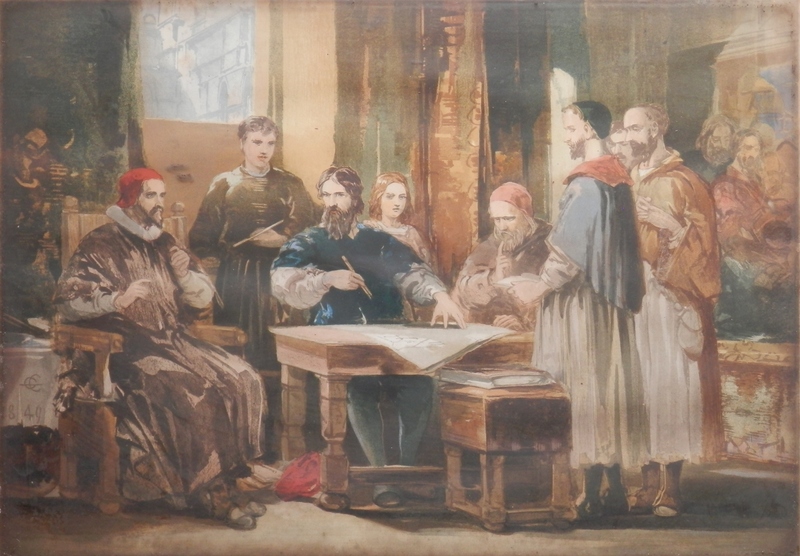 #GeorgeCattermole (1800-1868) is the original artist while #VincentBrooks (1814-1885) is the man who made the lithograph which I bought the other day. I present ‘Columbus propounding to the Prior of the Franciscan Convent of Santa Maria de Rabida, his theory of a new world’. A stunningly beautiful lithograph made in 1854. 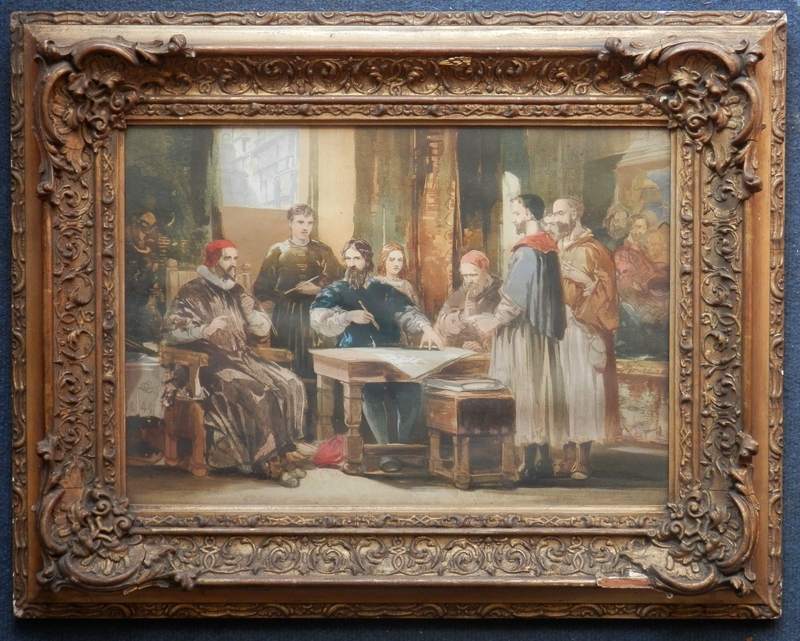 So far, I have not been able to find anything about the original painting by George Cattermole done in 1849. Born in Diss, Norfolk, George became a draughtsman and then ventured into watercolour and oil painting but his great strength was in illustrating. He was a friend of Charles Dickens and illustrated ‘The Old Curiosity Shop’ and ‘Barnaby Rudge’ for him. He was largely employed by publishers. He illustrated many a ‘The Waverly Novel’ as well as many other books. Vincent Brooks spent most of his life in the printing industry. He became famous for is lithographs. In 1865 Vincent Brooks became involved with the ‘inventor’ of colour printing George Baxter (Descent from the Cross in a previous chapter). He purchased many of Baxter’s plates and printed them using Baxter’s presses but this was a complex printing process using up to 20 stone blocks per print and was found to be a money losing venture. Mr.Brooks bought out the business of Day & Son Ltd in 1867. He bought their property, name, and fine reputation. The firm now became known as Vincent Brooks, Day & Son. 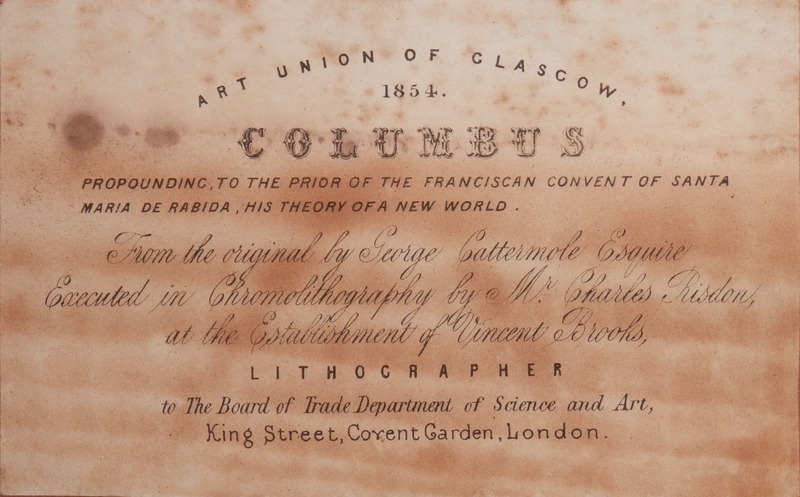 On the reverse we find a label from #ArtUnionofGlasgow with the date and title as well as the information regarding the painter George Cattermole and the lithographer Vincent Brooks. One also notices the fine frame it is mounted in although there have been repairs to it. I wonder where the original painting is or if even if it still exists. Maybe from my posting I might stir others to consider the great talents these two men had and possibly to appreciate their art even more. This entry was posted in Lithographs and tagged capes, Columbus, convent, desk, map, Prior, Rabida. Bookmark the permalink. Dear Sir, I have the exact same copy of your lithograph. My father purchased the copy in Glasgow 70 years ago. I wondered if you might be aware of the value of this lithograph. I am afraid I do not have a value for my chromolithograph. You might consider a trip to a local auction house for them to look at and value it. prints are much less valuable.